The Yamaha "DiASil Cylinder" Development of the world's first all-aluminum die-cast cylinder for high-performance engines, combining high functionality and low cost plus environmental benefits | Yamaha Motor Co., Ltd.
Yamaha Motor Co., Ltd. (YMC) has succeeded in the development of an all-aluminum die-cast cylinder with 60% better cooling performance and 30% cheaper production cost than a conventional cylinder (*1). Called the Yamaha DiASil Cylinder (*2), this is the worlds first all-aluminum die-cast cylinder and it achieves cooling performance equivalent to that of a nickel-plated cylinder, which is currently recognized as the best in the industry, but at a significantly lower production cost than a nickel-plated cylinder. This new cylinder is an example of the type of a new core technology that can be strategically important in promoting future growth, as described in YMCs Next 50 (*3) mid-term policy report released in April. The new Yamaha DiASil Cylinder is a technology that brings together an ideal combination of material, manufacturing technology and environmental friendliness. The material used is a 20% silicon content aluminum alloy, the manufacturing technology is the recently developed Yamaha CF Aluminum Die-cast Technology (*4), which enables the production of an all-aluminum die-cast cylinder. It is Yamahas exclusive CF Aluminum Die-cast Technology that enables the mass production of a die-cast cylinder made completely of 20% silicon content aluminum alloy, something that could not be done with conventional die casting methods. This next-generation technology promises to contribute to improved function and product quality for the majority of Asian market motorcycles and automobiles that presently use conventional pistons with cast steel liners. Recognizing the environment-friendly nature of aluminum, YMC has made aluminum technologies part of our core technology and actively increased the use of aluminum in our products. In February of this year, YMC introduced its new Yamaha CF Aluminum Die-cast Technology as a manufacturing technology for motorcycle chassis parts that enables the mass production of die-cast aluminum parts that are both thinner and larger than was possible in the past. Now this same technology has been applied to the manufacture of engine parts. This is also a technology that can be easily transferred to our overseas Yamaha manufacturing bases. From now on, YMC also plans to apply to new areas automobile and outboard motor engine parts. *1 Compared to conventional cylinder: Refers to cylinders that have a cylindrical cast steel liner (or sleeve) inserted along the inner wall of the cylinder to reduce friction resulting from the pistons movement. Used on many motorcycle engines. *3 Next 50: This is YMCs new 3-year (Apr. 2002 ~ Mar. 2005) mid-term plan aimed at building a corporate foundation to enable another leap forward in the next 50 years as YMC approaches the 50th anniversary of its corporate founding in 2005. One of the issues addressed in this new plan is promoting a growth strategy that involves core technologies that will enable the development of next-generation engines and components for our Eco Power Sources strategy, while at the same time seeking out new areas of business employing bio-technologies and IT technologies that lie outside the companys core technologies. *4 Yamaha CF Aluminum Die-cast Technology = Yamaha Controlled Filling Die Casting. This is a die-casting technology that utilizes precise control of the casting conditions (degree of vacuum in the die, die temperature, injection speed of the molten aluminum) to reduce the amount of gas bubbles in the finished cast piece to just 20% of conventional methods in order to produce higher quality cast parts. Introduced in Feb. 2002. The detrimental qualities of a cast steel liner type aluminum cylinder include the more complex manufacturing process, heavier weight and poorer cooling performance. Plated cylinders are presently used on high-performance motorcycles engines, but the production cost is higher. An all-aluminum cylinder manufactured with the DiASil Cylinder technology has no need for a cast steel liner or cylinder plating, which means a simpler production process. Whats more, it has the same outstanding cooling performance as a plated cylinder. This construction, in which a cylindrical steel sleeve is inserted along the inner wall of the cylinder, produces a cylinder which is very reliable from the standpoint of reduced friction and reduced possibility of engine seizure. That is why Yamaha uses this kind of cylinder on approximately 70% of all the motorcycles it manufactures. In the case of models for the markets of Asia and Central and South America, this figure reaches about 90%. However, there are also problems with the cast steel liner type aluminum cylinder, such as the complexity of the manufacturing process involved in inserting the steel sleeve, the poor recyclability of these cylinders and the limitations in heat transfer rate due to the presence of the cast steel liner (the heat transfer rate of steel is 1/3 that of aluminum). Other problems with cast steel liner type cylinders are environment-friendliness and manufacturing efficiency. On the other hand, there is an alternative type of cylinder used on high-performance motorcycles that replaces the cast steel liner with a layer of metal plating on the cylinder wall. This kind of plated cylinder has superior cooling performance (about 60% better than a cast steel liner type) but also has the problem of higher production cost. And while the cast steel liner type cylinder and the plated cylinder have been used on different models based on their relative merits, the industry has been seeking next-generation mass-production technologies for cylinders that would stop the rise in production cost and enable the production of cylinders that are both environment-friendly and highly functional. The Yamaha DiASil Cylinder is the product of a new technology that enables the low-cost mass production of an all-aluminum die-cast cylinder with excellent abrasion resistance, high production efficiency, excellent recycling potential and cooling performance equivalent to that of a plated cylinder. For a cylinder (inner wall) with high resistance to abrasion, an aluminum alloy with a high percentage of hard silicon particles is effective, and an alloy with a silicon content of 20% is considered to have the kind of abrasion resistance that is suitable as material for a piston. However, with conventional die casting methods, increasing the silicon content made it more difficult to cast parts with good contact-surface quality because of the increased occurrence of casting cavities created by pockets of gas (air) that form during the filling of the die and the solidification of the molten aluminum that decrease the strength of the final cast part. In order to produce a cast cylinder with a highly abrasion-resistance surface quality, the Yamaha DiASil Cylinder uses an aluminum alloy with 20% silicon particles. To made a cylinder of this material that until now was considered difficult to die cast with, the Yamaha-exclusive CF Aluminum Die-Cast Technology was used, with precise control of the die casting conditions to meet the specific needs of this alloy. In specific terms, (1) the degree of vacuum in the die, (2) the temperature of the die and (3) the speed with which the molten aluminum is injected into the die are all precisely controlled in order to produce cast metal that has a highly abrasion resistant crystallization character with an even distribution of hard silicon particles. This makes it possible to mass-produce high quality all-aluminum die-cast cylinders without cast cavities. 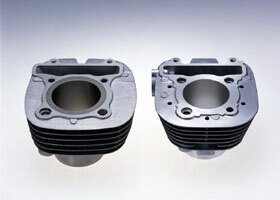 Because this new all-aluminum die-cast cylinder technology reduces production cost while also improving cylinder function, it is a technology that can contribute significantly to improving product function and cost competitiveness of motorcycles for the Asian market, where presently 90% of all motorcycles use cast steel liner type cylinders. It is also an manufacturing technology that can be applied to automobile and outboard motor engines. Due to conditions under which conventional die-casting occurs, including the degree of the vacuum in the die, the temperature of the die and the speed with which the molten alloy is injected into the die, there is a tendency for gas bubbles to form that limit the ability to cast parts with a good contact surface. Due to the facts that (1) the die is enclosed in a box that enables a high degree of vacuum in even complex die shapes with many slides (six time greater vacuum than conventional die casting), (2) more stable molten aluminum temperature because the temperature of the die is controlled and (3) improved injection speed for the molten aluminum (five times faster than conventional die casting), it is possible to mass-produce aluminum cylinders with more complex shapes and good contact-surface quality.